The men’s soccer team had a historic fall, capturing both the RMAC regular-season and RMAC Tournament championships on the way to an appearance in the NCAA Sweet 16. Mines went 17-4-1 behind the play of all-American forward Johnny Haist, who tied the program record with 22 goals scored, and all-American midfielder Niki Grotz, who set the Mines career assists record as a senior with 41. The season was highlighted by a heart-stopping 2-1 win over rival Colorado Mesa University on Nov. 5, 2017, to win the RMAC Tournament (pictured), as second-half goals by Trevor Amann and Haist rallied the Orediggers back from a 1-0 deficit. 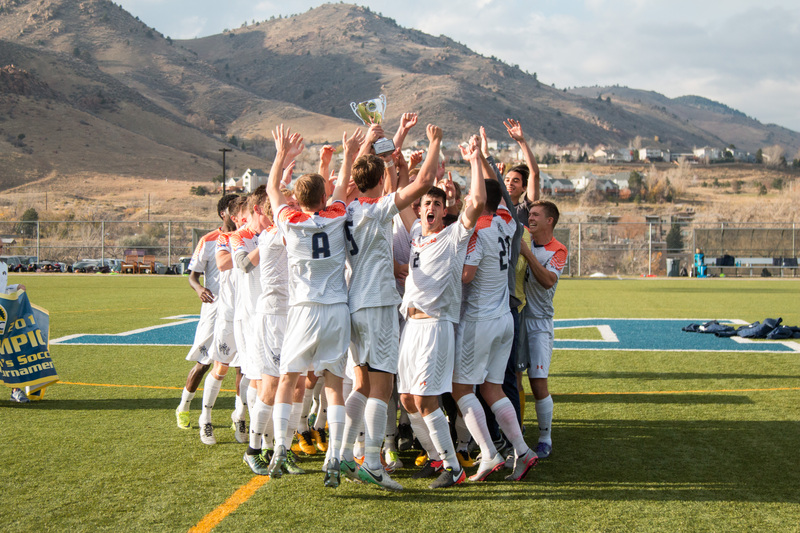 Mines ended the season ranked ninth in the nation by the United Soccer Coaches organization. The women’s soccer team advanced to its second straight NCAA Sweet 16 and third in four years with a 17-4-1 record. The Orediggers were led by one of the nation’s best defenses, captained by All-American Emily Garnier (pictured), who also led NCAA Division II with a Mines-record 15 assists. The Orediggers ranked in the national top-20 in almost every category, with an offense led by all-region honorees Jennifer Kendall (nine goals) and Brooke Stoermer (nine goals). Kendall and Devon Dunmire earned Academic All-American honors, and Kendall was named the RMAC Academic Player of the Year, the first in Mines women’s soccer history. Mines volleyball continued its run of success in 2017, earning a share of the team’s fifth RMAC regular-season title since 2012 with a 25-6 overall record and 17-1 mark in conference play. Their record helped them make yet another appearance in the NCAA Division II Volleyball Championship tournament, where the Orediggers beat Angelo State University to advance to the second round for the third consecutive season. All-American setter Marina Hansen set a new Mines record averaging 12.96 assists per set, and the Mines offense ranked in the national top-10 in kills and hitting percentage. Mines had six all-RMAC selections, including freshman outside hitter Lindsey Jin, who went on to be named the regional freshman of the year, and first-team all-RMAC middle blocker Abby Tiesman. Mines football fans saw something in 2017 that hadn’t happened in their lifetimes—maybe even in their parents’ lifetimes. Sophomore running back Cameron Mayberry ran for an incredible 1,565 yards, breaking the Mines single-season record that stood since 1939, when Lloyd Madden ran for 1,316 yards. Mayberry powered one of the nation’s best rushing offenses with 18 touchdowns, and his 312 yards at Adams State University snapped the program single-game record that stood since 1992. Overall, the team went 7-4, their 11th consecutive winning season dating back to 2007, and earned 17 all-RMAC selections, including first-team picks Mayberry, wide receiver Brody Oliver and linebacker Dean Wenger. The men’s cross-country team won the RMAC team championship for the second straight season and took third place at the NCAA Division II Championships meet on Nov. 18, 2017. Senior Grant Colligan (pictured second from right) won the RMAC individual championship and went on to place fifth at nationals, the best finish ever by an Oredigger. Colligan was also named the RMAC Runner of the Year and Academic Runner of the Year. In addition, Logan Ramlet, Ricardo Ocampo and Josh Hoskinson were named all-Americans. The women’s team had arguably their best season in its history, recording a second-place team finish at both RMAC Championships and NCAA South Central Regional Championships before going on to finish 11th at nationals, their best showing since 2014. Molly Reicher (pictured) earned an all-American finish and was later named the RMAC Academic Runner of the Year, marking the first time the Mines men and women swept the conference awards.